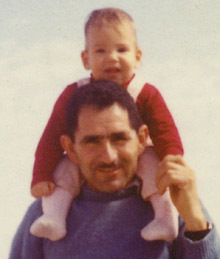 Shortly after the Six-Day War in 1967, noted Israeli author Amos Elon and his wife, Beth, hired a Palestinian man to care for their 6-month-old daughter, Danae. Musa Obeidallah continued in this role for the next 20 years and was able to save enough money to send his eight sons to the United States. In the early 1990s, amid the mounting tension of the Israeli occupation and the Palestinian Intifada, the two families lost track of each other. In her documentary, Danae Elon sets out to find Obeidallah, first reconnecting with his sons, in New Jersey, and then reuniting with Obeidallah himself. The film explores the delicate boundaries between family, class and politics, and uncovers an emotionally complex story that is ultimately optimistic. “An amazing achievement,” writes Los Angeles Times film critic Kevin Crust, who calls the movie “touching, painful and powerfully affecting. The bond between this Palestinian man and the Israeli woman he helped nurture is so palpably strong and pure….Seldom does something so personal resonate with such universal implications. If governments and politicians could deal with one another with a fraction of the compassion that Elon and Obeidallah families do, the world would obviously be a better place.” Another Road Home has been recognized at film festivals around the world.